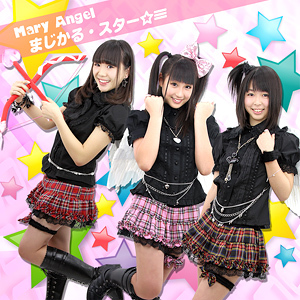 bunny☆kaisui's blog: Mary Angel 1st Album "Magical Star ☆≡"
Mary Angel is releasing their first album this March 16! It will contain all of their single's a-sides (except their last one, Shukan -shine heart-) and some of their b-sides plus some new/not released yet songs! While I already heard/seen full versions of Kira Kira Smiley, Tokimeki High Speed & PRISM ... I never heard the full version of SUPER ACTION! I'm pretty sure Rebirth is a new song, so I'm looking foward to it, too. It's nice to know they're going to edit those songs... but I'm not sure if that song they performed recently (MUSIC ON) it's new or if it's just some cover of a song I don't know. Since my favorite song of them is Magical Star, I've been seeking for that single for some time... but it's not easy to get. So I think the best choice is to buy this album instead... so I could have the other songs too :D! I leave you with performances!